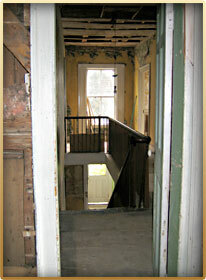 The staircase features a lovely simple 19th century handrail and its original spindles. 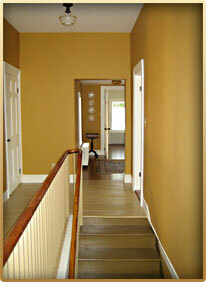 The upstairs hall is painted the same ochre as the downstairs hall. 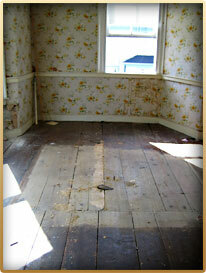 Its original plank floor is plain. 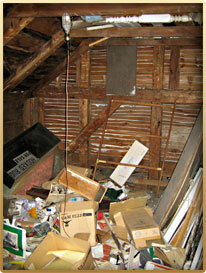 Ceilings are almost two feet higher upstairs than down. This extraordinary room features all its original window mouldings, one set of door mouldings and its original mantelpiece. 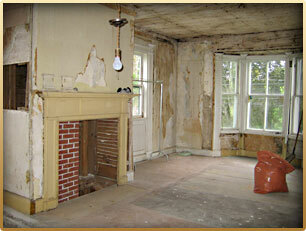 Two other sets of door mouldings were replicated and the chimney was rebuilt. The room is painted the same shade of sky blue as its original wallpaper and its wide plank floor the original deep Turkey red colour. It is truly a stunning space. 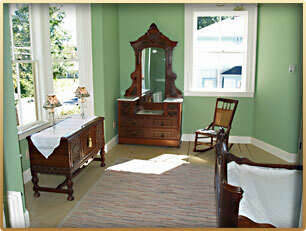 Vintage chandeliers and sconces complete the picture. Directly off the master bedroom, the closet features two walls of hanging storage with shelving above. 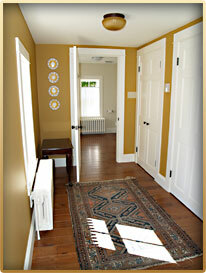 It has a new laminate wood floor and leads through to the master bath. The four piece master bath features a large walk-in shower with mosaic tile decoration and glass door, a vintage footed bathtub, Kohler pedestal sink and toilet and small matching tiled twig table. 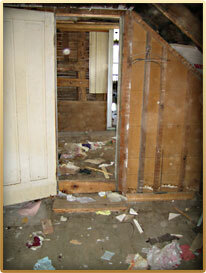 It has a new laminate wood floor. This bedroom has two new built-in closets and features a vintage chandelier I picked from my neighbour’s garbage many years ago in Montreal. The wall lamps are also vintage. 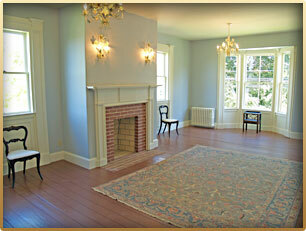 The room’s wide plank floors are original. 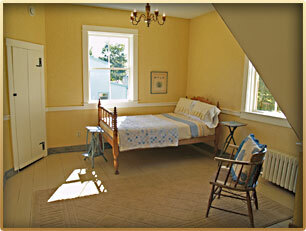 This bedroom has a small closet tucked into the chimney space, with a lovely old door and H and L hinges. 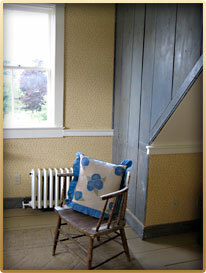 It features its original painted baseboard and wide board paneling on the attic staircase wall. A vintage brass chandelier, salvaged from a local Annapolis Royal house by my electrician, hangs over the original wide plank floors. The laundry and the linen closet are tucked into the continuation of the upstairs hall in the ell section so that they are not visible from the rest of the house... an elegant solution to a day-to-day task. The laundry has a new laminate wood floor. 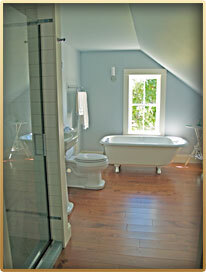 The family bath is light and airy, thanks to the new shed dormer and two pretty windows. 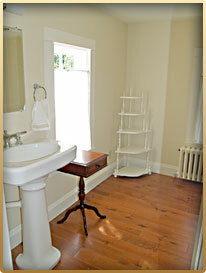 It features all Kohler fixtures - a tub with shower, toilet and pedestal sink. 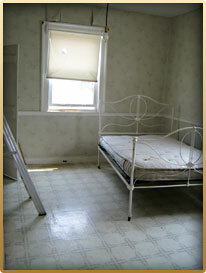 It has a new laminate wood floor.